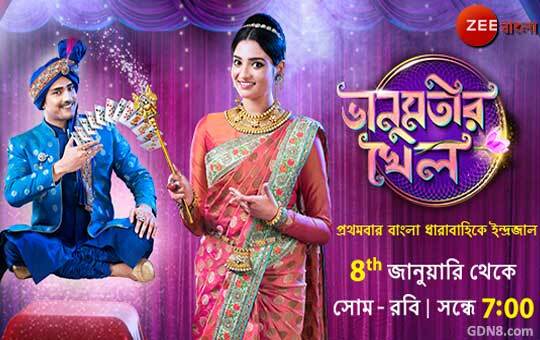 Bhanumotir Khel Serial Title Song Lyrics from Bhanumatir Khel Zee Bangla Serial is a Bengali television Soap Opera that premiered on 8th January 2018 Monday to Sunday at 7.00 PM airs on Zee Bangla starring Rubel Das is a main male lead role and Shreyosree Roy acting as a main female lead role Music has been composed by Joy Sarkar Zee Bangla presents the Vanumotir Khel, the tale of magic. Bhanumoti, the daughter of an magician learns the tricks of the trade very young age. Meghraj, is also a practicing magician Son of the super magician, Mahendra Sarkar. Vanumatir Khel Serial is a magical tale of Love & Romance with a touch of magic, Watch Title Track with lyrics Only On Zee Bangla, ZeeBangla HD And Ozee Network. Aral theke kol-kathi ke narche sara bela..